The Oster Pro 1200 Plus Blender has a low profile design, making it easier to fit under cabinets on your countertop. The Oster Versa is a powerful blending machine with 1,200 Watts of power. Oster machines have a good reputation for quality machines at lower prices. These type of countertop blenders are perfect for making smoothies and general purpose blending. Its 6-point stainless-steel blade and an extra wide base to ensure food blends with minimal pockets of air. Great for Smoothies. Using Dual Direction Technology, the blender reverses direction automatically to free jar jam-ups. Included is an all glass 48oz container, along with a BPA Free Smoothie To-Go 24oz Cup. The smoothie cup fits right on the blender, so you can make personal size servings. The lid has an opening with lid to add ingredients. 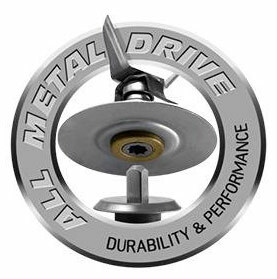 The all-metal drive provides durability and longevity. Oster is a trusted brand that goes back over 100 years. 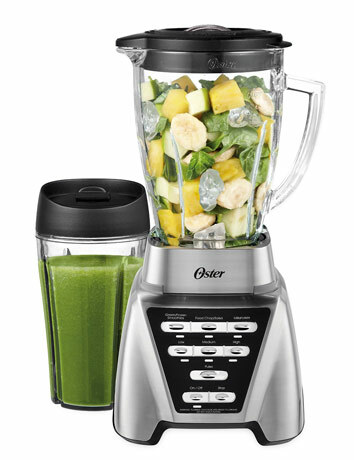 Oster Pro 1200 Plus Features: The Pro 1200 watt series upgrades with Pre-programmed settings to automatically handle Smoothies, Milkshakes, and Salsa/Chopping, and shut-off automatically. The blender also has low, med, high speeds, as well as low and high pulse. The Pulse button can be used for quick manual blending, or cleaning. All metal drive for durability. A sturdy base will prevent movement or slipping during operation. Oster Warranty: 1 year Limited Warranty. What’s in the Box? : Oster Pro 1200 Plus BLSTMB-CBG-000 blender, 24oz Smoothie Cup, 48oz Container, 2 Recipe Cookbooks. Smart-Review Commentary: The Oster brand has an excellent reputation with over 100 years of history. The Oster Pro 1200 Plus Series blender maintains this tradition. This is an entry level blender with 1200 watts of power, an all metal drive, and glass jar. The blades will reverse to prevent jams. The Oster Pro 1200 also includes 3 Pre-programmed and timed settings for Smoothies & Frozen Beverages & Milkshakes, and to chop food. It has a 48oz glass container for blending, and includes an on the go Smoothie cup that mounts right on the blender. The Pro 1200 Plus model has received excellent consumer reviews for a blender in its price range. This blender offers tremendous value, with many good basic features, and a 1-year limited warranty. The Oster Pro 1200 Plus is a Smart-Review top pick for Blenders under $100.